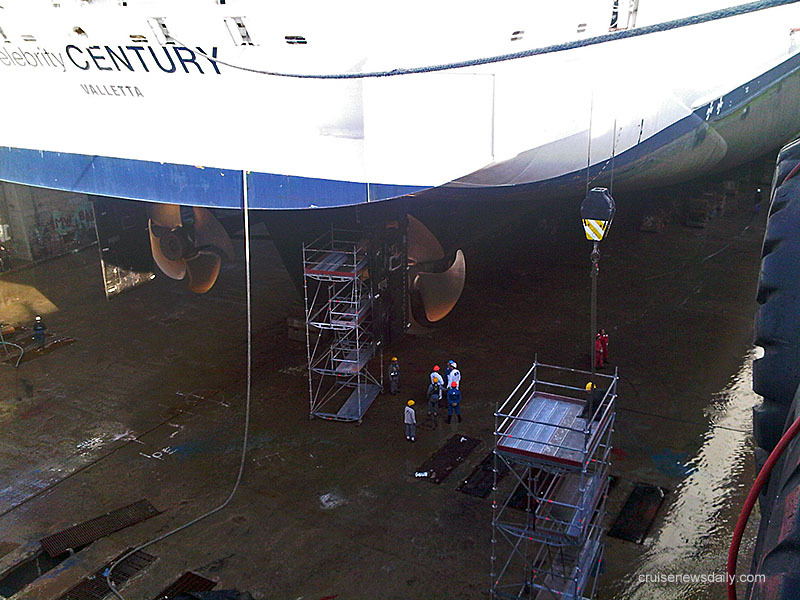 Celebrity Cruises reports the work to repair Celebrity Century's rudder issue continues to go smoothly and on schedule at the yard at Marseilles. As you can see in this photo taken this morning, the rudder is currently off the ship. (Click photo for larger view.) 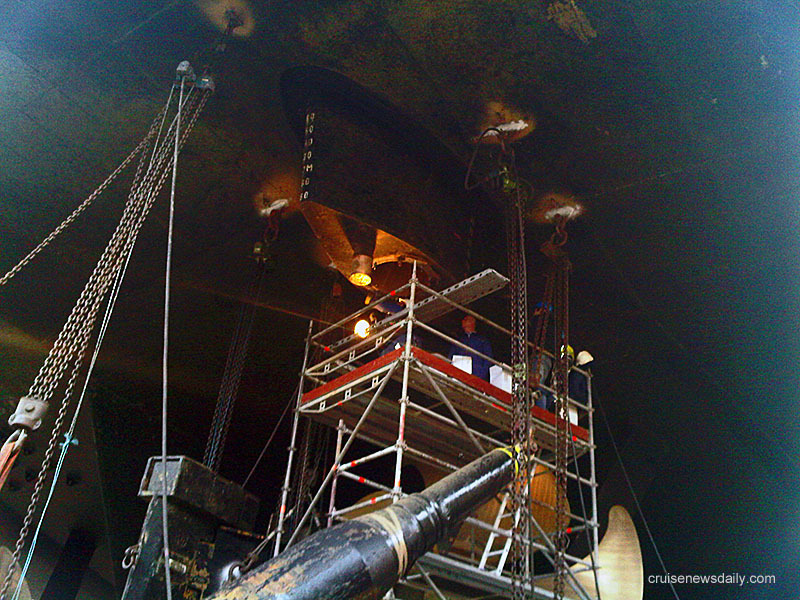 The drydock schedule calls for the rudders to be reinstalled tonight. Celebrity says passengers scheduled to board the ship on Monday at Barcelona should proceed to the city, as they expect the ship to arrive on time for departure on October 25. After the earthquake struck Haiti in January, Royal Caribbean quickly resumed calls at its private beach resort on the island's north shore at Labadee. Even though they were getting hammered by the general media at large which tried to paint an inaccurate picture of rich passengers frolicking on the beach with the destruction of the quake a few yards away on the other side of a fence surrounding the property, RCCL stayed the course and continued calls in Haiti because they knew that, as a large employer in Haiti, jobs were exactly what the country needed. In reality, the effects of the quake were many miles away in an area around Port au Prince, and in addition to bringing passengers, Royal Caribbean ships also brought more then 3,000 pallets of relief supplies to Labadee that would be transported to the needy areas in the south of the country. Cruise lines do a lot of charitable work, especially in their ports of call, and most of it is never noticed by the media or their customers. It comes in cash and goods. Five thousand dollars here for some community project, ten thousand there for a school's new basketball court, five hundred used television sets for charities in another port. And sometimes, something exceptional comes along, and we especially like to highlight those, and RCCL just donated something to the people of Haiti, which will continue giving to them for generations. The complete article appeared in the October 22, 2010, edition of Cruise News Daily. CND subscribers read about Savannah's study of the cruise industry, and what they didn't find out ... updates on Celebrity Century's emergency drydock ... what the British Virgin Island's don't seem to realize about dealing with cruise lines ... new estimates by the cruise industry of what Cuba's missing ... and a record-breaking cruise season in Seattle. Details of these items appeared in the "Other Things You'll Want to Know" column in the October 22, 2010, edition of Cruise News Daily. 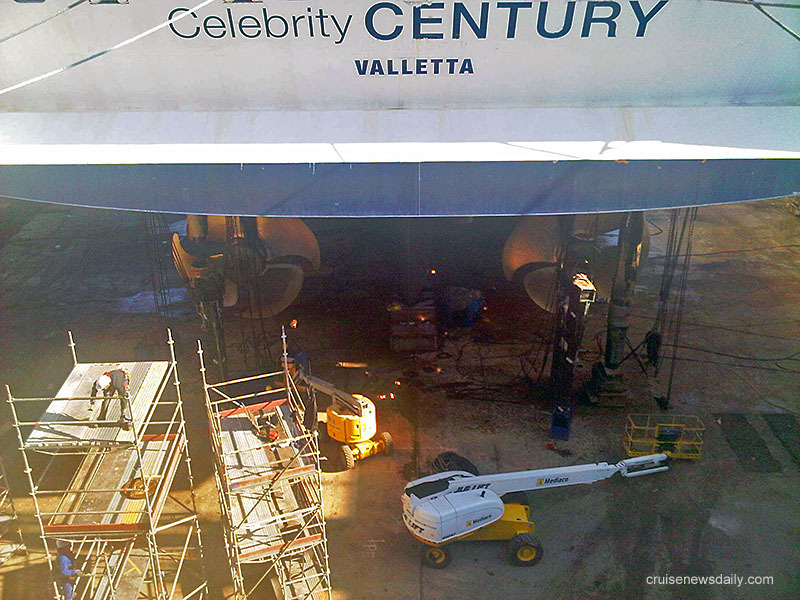 Celebrity again said the work remains on schedule to have the ship back in service for the next cruise on October 25. They again said passengers on that sailing should proceed to Barcelona, and if anything unforeseen delays the ship's arrival in Barcelona, Celebrity will provide accommodations and cover incidental expenses on land until passengers can board the ship. Beginning with sailings departing January 1 and after, no matter what kind of offbeat hard-luck story you come up with, Carnival is going to let you reschedule your cruise (for only a small fee). Carnival Cruise Lines has joined the ranks of lines offering a "cancel for any reason" travel protection plan. Details appeared in the October 21, 2010, edition of Cruise News Daily. InnerSea Discoveries has purchased some of Cruise West's assets, but if Cruise West owes you money, you probably shouldn't get excited, nor should anyone look for the revival of the defunct cruise line. On the other hand, if you are a past passenger of the line, you may look forward to some new brochures coming your way. In this article, which appeared in the October 21, 2010, edition of Cruise News Daily, we look at what InnerSea Discoveries bought, and why creditors (and customers owed refunds) shouldn't expect to see any money. CND subscribers read about the end of the line for Carnival's Ocean Village brand ... another update on the repairs to Celebrity Century ... Windstar getting into the garment business ... and a perfect score for Costa Atlantica on its US sanitation test. Details of these items appeared in the "Other Things You'll Want to Know" column in the October 21, 2010, edition of Cruise News Daily. This story appeared in the "Other Things You'll Want to Know" column in the October 21, 2010, edition of Cruise News Daily. The Port of Miami reports a record-breaking year last year for the number of cruise passengers passing through the port. And again, it was a world's record. While there are champagne corks popping in Miami, toasting the string of three years in a row with number-one cruise port honors, they also have to be looking over their shoulder at their neighbor to the north, Port Everglades which would seem poised to slide into the number-one spot. In this article, which appeared in the October 20, 2010, edition of Cruise News Daily, we take a look at Miami's accomplishment this year, what may have helped them, and what could hurt their chances of staying in the number-one spot next year. CND subscribers read about Celebrity Century being moved into drydock for repairs to its rudders ... an update on the collision of Costa Classica ... a new tax on visitors to Venice ... a very few cases of norovirus on Caribbean Princess generating a lot of headlines when the ship arrived in eastern Canada ... Boston opening their newly refurbished Black Falcon Cruise Terminal ... and a new product to keep the bed on your cruise ship free of bed bugs. Details of these items appeared in the "Other Things You'll Want to Know" column in the October 20, 2010, edition of Cruise News Daily. When Costa Classica collided with the Belgian-flagged cargo vessel Lowlands Longevity on Monday in Shanghai, it opened a 60-foot gash in the cruise ship. Now we have the first video of the damage from Chinese television. While the report is in Chinese, you don't have to speak it to see the extent of the damage in the video. The Shanghai Daily reports that the ship was taken to a local shipyard for repairs Monday afternoon, which the line expects to be completed in four days. By the plethora of offers on just about every sailing, it's easy to see that the luxury end of the industry is working hard to fill their ships. That abundance of space is finally giving a break to one segment of the market who seldom gets a break: the single traveler. The complete article appeared in the October 19, 2010, edition of Cruise News Daily. Royal Caribbean's Legend of the Seas, may be out of sight and out of mind to most Americans since it is sailing in the Far East, primarily carrying passengers from Asian markets, but it won't be forgotten by at least three of the crew members from the Xin Yi cargo vessel. Last night, while sailing in the Taiwan Strait at 10:23pm, Legend of the Seas heard a distress call from the Xin Yi, and immediately changed course for its nearby location. The cargo vessel was sinking in heavy seas with 22 crew members aboard, and Legend was the nearest ship. 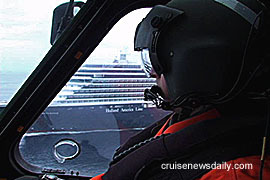 Details appeared in the October 19, 2010, edition of Cruise News Daily. CND subscribers read about Carnival declaring a dividend ... a new version of the SS France ... an unusual entry by Princess' president in their new blog ... and when a swimming pool isn't for sunning and swimming on Holland America. Details of these items appeared in the "Other Things You'll Want to Know" column in the October 19, 2010, edition of Cruise News Daily. Will Le France Sail Again? A French firm is trying to get an updated version of the SS France built, and they have released a new concept video. * Modern design combining finesse of lines and open space. * 260m long, approximately 550 passengers : far from the race to make ships of behemoth proportions, the new France is a large ship but limited to provide comfort and well-being. * A long hull will receive two chimney-shaped super-structures in honor of the old France : each will house spacious living areas, restaurants and salons dedicated to well-being and relaxation. * Between these two chimneys, a tropical palm-tree garden will spread over 1 500 square meters, as if a cruise on the France were an island vacation. * Endowed with the latest technology available, the France will also be a "green" ship, will consume less energy and the shape of her berth will allow precise control of the energy used for navigation. * The bow of the ship was designed to re-create proximity between passengers and the sea : the decks stack to end in a large beach where nautical activities can be practiced. * A cruise program of new and original destinations. This morning as Costa Classica was returning to Shanghai at the end of a 4-night cruise and collided with the Belgian-flagged Lowlands Longevity cargo ship, damaging the 53,000-ton cruise ship's starboard superstructure at Deck 5, according to Costa. Local news reports say the collision, at the mouth of the Yangtze River, opened about a 60-foot gash, and passengers say water washed into the ship's lower decks through broken portholes. Details of this incident, and an earlier incident aboard the same sailing, appeared in October 18, 2010, edition of Cruise News Daily. Disney set the date today for Disney Fantasy's maiden voyage and released partial details of the 2012 fleet deployment. Disney's second new ship of the two-ship order from Meyer Werft, Disney Fantasy, will enter service on April 7, 2012 with 7-day Caribbean cruises. In this CND article, we also looked at the rest of the initial 2012 schedule and had some observations on the implications. The entire article appeared in the October 18, 2010, edition of Cruise News Daily. Costa Classica loses passengers, Pacific Jewel cancels sailing, Update on Celebrity Century, Medevac from Osterdam, and Carnival's "bucket list"
CND subscribers read about an additional problem on Costa Classica's last cruise where Chinese passengers illegally remained behind in South Korea ... Pacific Jewel canceling an additional voyage for repairs to the ship's propulsion system ... an update from the yard on Celebrity Century's emergency repairs to its rudders ... a medevac from Holland America's Oosterdam (shown above) ... and Carnival's "bucket list." Details of these items appeared in the "Other Things You'll Want to Know" column in the October 18, 2010, edition of Cruise News Daily.